"Penny Lazarus has spent her entire life wishing she could escape from the real world. Through it all, she had exactly one friend - her twin sister, Dana - and now Dana's dead, drowned in the distant Pacific under mysterious circumstances. But she left something behind, meant only for her sister's eyes: a cryptic document that sends Penny off to the wilds of Appalachia...and then straight off I-64 and into a madcap alternate America. Here, in the hidden world known as the Back Roads, every individual's deepest desire emerges as a powerful supernatural ability. In Penny's case, that means she's a Veil, capable of turning herself invisible, intangible, ghost-like. Stranger yet, this is a place Dana somehow knew about. Now Penny must fight her way across a nightmare landscape of cyborg bikers, man-eating mosquitoes, snake-handling zealots and warring Cherokee demigods in search of the truth. What she hoped to find were the answers behind her sister's death. But what awaits her at the end of the road is something even bigger - the dark secret of her own world-shattering destiny. 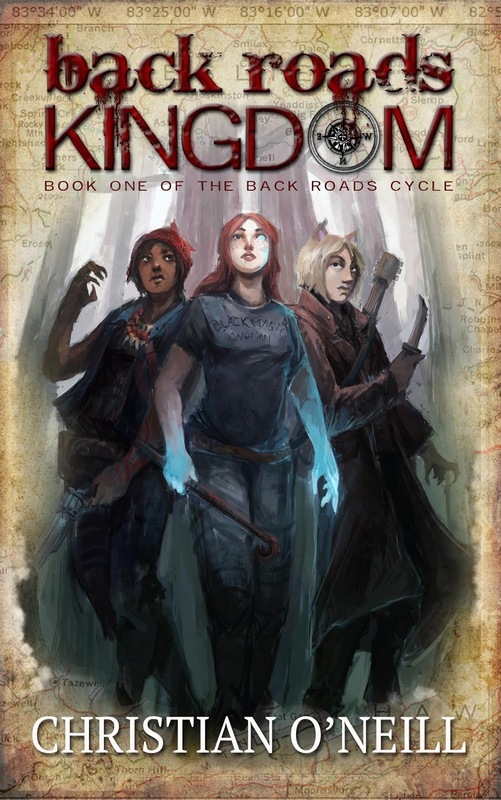 BACK ROADS KINGDOM is the first volume in a thrilling new American fantasy saga that weaves together Appalachian folktales, urban legends and paranormal lore into a dark and hilariously twisted coalpunk epic." I commissioned a very talented young artist named Jason Nguyen to do the illustration. The book is very character-driven and I wanted that to shine through. I love these three central characters a lot and they just needed to be front and center. I took Jason’s illustration and composited it into an old American highway map, and tried to give the whole thing a dirty, gritty overlay. Where do the ideas for your books come from? They come from everywhere! I have really diverse interests and I’m constantly sponging up everything I read, watch and listen to. My subconscious chews it all up and spits it back out in a new, shiny form. I think that’s what creativity is. Have you ever co-written book/books? If so was it difficult? If not would you ever consider co-writing with another author? This is my first novel, but I have co-directed a film (my documentary 41) and I’ve collaborated on theater projects too. In a word…it’s hard. You have to find just the write collaborator to complement you and you have to work hard to maintain an improvisational, “accept all offers” mindset. That being said, two of my favorite authors are Margaret Weis and Tracy Hickman, and they co-write 90% of their stuff. Where do you get your character names from? My book was play-tested as an RPG campaign, so some of my names come from my brilliant players. I seem to find name-creation a little harder than they do. I make extensive use of Find and Replace and I’m sometimes changing character names at the very last minute. I’m fond of allusions. My protagonist’s name – Penny Lazarus – is full of Statue of Liberty references: Penny for the original copper color of the statue and Lazarus after Emma Lazarus, who wrote the famous “Give me your tired and your poor” poem. What type of research goes into your writing? So much research! Because my book takes place in a fantasy version of Appalachia, I dove deep into that whole world – the dialect, the local customs, the folklore, the music…it’s a rabbit hole! The research is almost as much fun as the writing. Are your family and friends supportive of your writing? So amazingly supportive. I’m very blessed. Do you remember when your interest in writing came about? When I was in Elementary School, my class was assigned a writing project: create hand-written, hand-bound short stories for a statewide competition. Mine was 250 pages long. It needed to be bound with packing tape and coarse thread. Other than writing what are your interests? Theater, movies, TV, history, religion, mythology, anything superhero-related. Basically anything where good guys punch bad guys. Did you learn anything from writing your books, if so what was it? How hard it is to write a novel! Professional authors make it look easy. But a finished, polished novel is the result of so, so many rounds of revision and so, so much beer. What are your current WIP? Can you share with us? The second book in my BACK ROADS series. It’s called BACK ROADS REVOLUTION. I have a draft now and I’m working diligently to make it great. It’s more epic in its scope than the first book, a bit more GAME OF THRONESy, and it’s a tiny bit heavier on the romance too. It’s pushing me outside of my comfort zone in more ways than one. Food Fancy donuts. Come visit me in Brooklyn and I’ll show you what’s what. Color Whatever suits my fancy on any given day. But usually black. Movie Eternal Sunshine of the Spotless Mind. Day or Night Are there actually authors out there who would pick Day? Rain or Snow Snow, please God, all the snow. Mac or PC Mac. Sorry. Coffee or Tea Both, but in another, more accurate sense, coffee. Christian O'Neill is a writer/director/other living in New York City with his wife Leah, a librarian who is also the Empress of Desserts, she says, because of something called "Swarm," and his 5-year old son Asher, who knows one karate move and uses it often, regardless of what mood he's in. He studied ancient history at Providence College in the hopes of becoming actual Indiana Jones, and then went on to earn master's degrees in Theater Education from Emerson College and Directing from Brooklyn College. He now knows more about theater than Indiana Jones did. He works by day as a social worker in the NYC foster care system, because he saw Les Miserables when he was 14 and it stuck with him. BACK ROADS KINGDOM, his first novel, is the culmination of decades of telling people that he would someday write a novel.